Weapon Damage: 100%, 2.0 speed. Description: Recommended enhancement: Hybrid. Time flies in a straight line, unless its Chaorrupted! 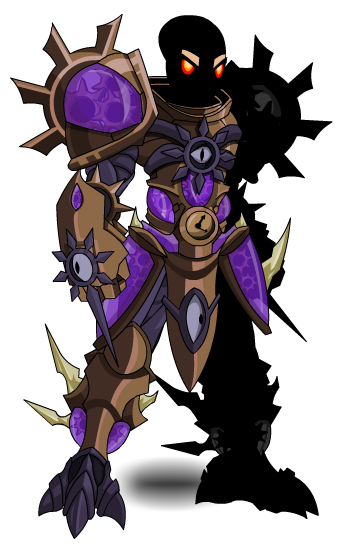 You'll never know in which time, or with what powers you'll wind up when you have this armor equipped. Attack while under effects of Chaos Rift. Description: Deals light damage to the target and applied Chaos Rift to the caster, a stacking effect (up to 4) that other abilities rely on. Description: Heals you with a HoT for an amount based on the damage you’ve recently taken while under the effects of Chaos Rift (up to 40% of your HP) OR Applies Time Bleed effect to the foe (DoT based on stacks of Chaos Rift). Consumes Chaos Rift stacks. Applies Unstable Rift, boosting haste but preventing Chaos Rift from being applied for 6 seconds. Description: Deals damage based on the damage you’ve recently dealt while under the effects of Chaos Rift. Consumes Chaos Rift stacks. Applies Unstable Rift, boosting haste but preventing Chaos Rift from being applied for 6 seconds. Note: At 4 stacks of Chaos Rift, deals 150% of the damage dealt by the player in the last 10 seconds. Description: Dodge chance increased by 10%. Description: Damage Increased by 10%. Description: Either increases Haste, Damage and Crit for 6 seconds, OR stuns enemy for 6 seconds and has a chance to hit for massive damage. causes one large hit for massive damage and stuns enemy for 6 seconds. Thanks to Andreomago, GustavoKnach, King Aleksandar and Zerkris.